Welcome to the American Blues Guitar in 6 Weeks course. These lessons are designed to focus your practice towards realistic goals achievable in six weeks. Each week provides you with techniques, concepts and licks to help you play and understand blues soloing at a manageable easy to follow pace. Week 1 *Stevie Ray Vaughan* Includes: Blues scale patterns, blues phrasing, playing the 'shuffle' feel, double stops, using trills, hammer-on's and pull-off's, using triplets, adding chromatic passing tones to the blues scale, and three important licks in the style of Stevie Ray Vaughan. 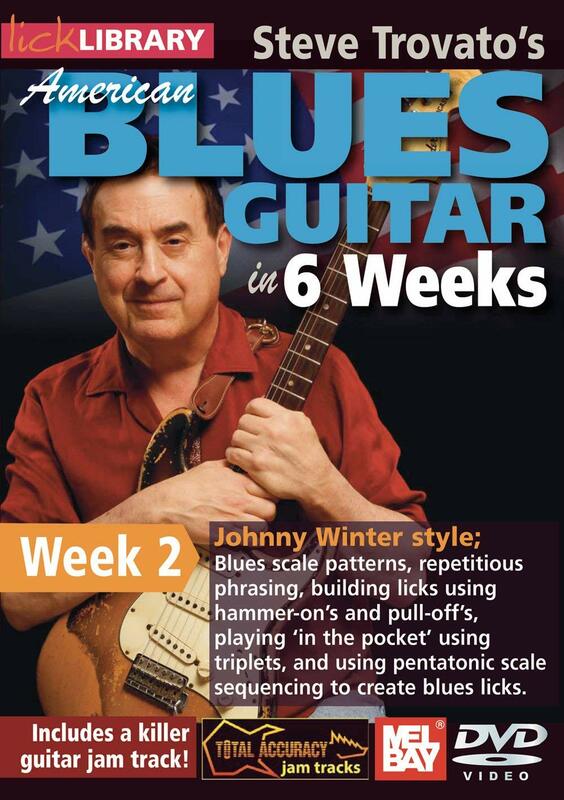 Week 2 *Johnny Winter* Includes: Blues scale patterns, repetitious phrasing, building licks using hammer on's and pull off's, playing 'in the pocket', using triplets, using pentatonic scale sequencing to create blues licks, and three important licks in the style of Johnny Winter. Week 3 *Albert Collins* Includes: Learn a blues scale pattern, learn a pattern for the major pentatonic scale, using double stops, shifting positions for longer licks, learn to combine scales to create great blues licks, and three important licks in the style of Albert Collins. Week 4 *BB King* Includes: Learn a blues scale pattern and a pattern for the major pentatonic scale, learn the famous BB King vibrato, learn bending and which notes to bend, learn to combine scales to create great blues licks, and three important licks in the style of BB King. Week 5 *Jimi Hendrix* Includes: Learn a blues scale pattern, learn the Jimi Hendrix vibrato, learn the 'blues rake', learn how to use phrase repetition, and three important licks in the style of Jimi Hendrix. Week 6 *Albert King* Includes: Learn to shift position to create longer blues lines, learn to play multiple note bends on a single string, learn to bend in intervals, combine techniques from all other lessons in the series, and three important licks in the style of Albert King.